Spy Optic produces sport eyewear for extreme athletes. 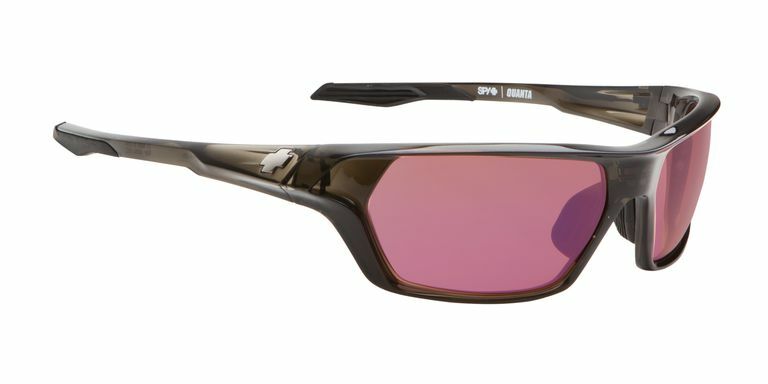 Walkers can benefit from the technology to get a pair of sunglasses that cuts the glare, protects you from all ultraviolet light, and stays in place despite sweat and wind. The Spy Performance line has several designs, and which one you choose will probably depend on a style choice. I got a pair of the Quanta design to review and I took them out for some good walks to put them to the test. My husband immediately started calling me "Bono" as he thought they resembled the glasses worn by the U2 frontsman. OK, maybe I'd go for a different style. The frames are build from Grilamid (TM) which they promise is virtually unbreakable. I didn't do a breakage test, although that interests me since my sunglasses usually meet their doom when they fall out of my purse and I step on them. The frames come in three types of black, brown, or white. More important for me with any frame is -- does it stay in place on my face despite sweat and wind? The Spy Performance sunglasses have Hytrel (TM) rubber nose pads and temple tips. I wore these through a very sweaty half marathon where I had rivulets running down my face and a headwind. No slippage. Yet neither were they too tight on my temples. With this full-frame design, the lower part of the frame met my cheeks and I would actually have a build-up of sweat under the glasses, which would finally run off down my face before creating a problem. Fogging is always a problem for walkers. I gave these the big test -- I was out on a cool morning, walking the half marathon with a high heart rate, and using porta-johns along the way. These glasses say they have a patented Scoop (R) venting system to combat fog. I got fogging going into and coming out of the porta-john as I do with my usual Ray-Bans. But the fog cleared within a second or two rather than requiring me to remove the glasses and wipe them off. I was impressed. The ARC (r) polycarbonate lenses promise to be impact resistant. I didn't want to take a face plant to test that, as my walking buddy did while I was wearing them. She destroyed her Maui Jims as face met concrete due to a toe-catching upraised sidewalk. I'm not going to ask her to try the same thing with the Spy Optic glasses. The lenses are replaceable and available in several combinations. I was intrigued, but the Spy web site and promo materials didn't tell me why I'd want the different lens colors. I found that via our Vision Guide's hints for choosing tints for sunglasses. I've been wearing Ray-Ban grey lenses for 25 years and don't know why I'd want anything different. It turns out that the rose lenses of the review pair are good for overcast conditions, as I often encounter here in the rainy Northwest USA. Grey and Grey Polarized work best in sunny conditions. Bronze provides good contrast, especially in low light conditions. The Spy lenses also come in yellow and clear. I realized there might be a reason to order replacements to change out between different weather conditions. I was impressed with these glasses in several ways. First, that they didn't slip during a true test that would have had me pushing my glasses back up my nose for some other designs. Second, they truly did defog fast, and probably resisted fogging to begin with. Third, I kind of like the rose colored glasses, even in bright sunlight. Now I'm interested in trying out different replacement lens colors in different light conditions. However, I would probably choose a less Bono-like design when shopping for them myself. Our Guide to Fashion offers the rule of thumb that you want a lens and frame shape different from the shape of your face. The square-ish Quanta design is too much like my square face. I should look for a design where the lenses are more oval. However, it's the performance more than the style I care about. I don't want crow's feet from squinting and from UV damage. Can One Yoga Bra Offer Style, Support, and Coverage?